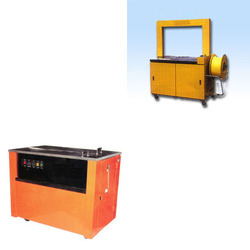 Our company specializes in providing of Carton Strapping Machines for Textile Industries. These offered machines are designed and developed under the supervision of our team in such a manner that proves to be highly beneficial for applications in various. Our company specializes in the manufacturing, supplying of Carton Strapping Machine for Textile Industries. This range of machines has been highly reckoned for its high tensile strength, easy maintenance and an enhanced longevity in terms of service.This machine is used for packaging in the pharmaceutical industry.